My pick for this week is definitely the most interesting restaurant that I have been to on my food journey. Melt is the result of a coffee and ice cream shop that were “melted” together to create an eclectic spot specializing in waffles. Having moved its location from Cardondolet to Cherokee Street about a year ago, this restaurant offers food, coffee, and bar service and is open until 3 a.m. on Friday and Saturday nights. Whether you come for brunch or in search of a late night snack after the bars close down, there is something here for you. Walking into the restaurant, I was overwhelmed by the amount of stuff around me. 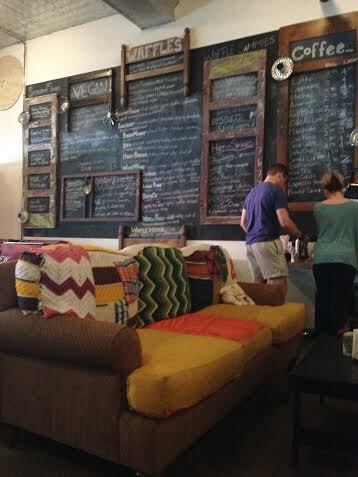 To best describe it, imagine having brunch in a thrift store. Lighting is made from old bike wheels, none of the tables and chairs come from the same set, meals can be had on couches or oversized chairs, and the menu is written on the wall in boxes separated by windows, door frames, and headboards. If you are looking to add a little excitement to your meal, you can play ski ball, pin ball, or choose from one of the many board games that are scattered throughout the restaurant. We arrived on a Sunday morning for brunch and while it was crowded, there was surprisingly no wait. We were given the option of being seated at a high top table but we chose the oversized chairs with a small table in between.While comfortable, it was not the best spot for enjoying a meal. We had great service the entire time and were able to order right away. I chose to start with coffee and I was instructed to help myself at the coffee bar. The mugs were hanging on hooks on the wall and each one was more different than the last. The cup I chose was in the shape of a peanut that had a huge red smile and feet on the bottom. I filled my cup with Kaldi’s coffee (my favorite) and was able to return for a refill when I needed more. The rest of the coffee menu was large but not overly imaginative and the prices were better than we often pay. They also offer smoothies, a full bar, and a long list of beer. I had an incredibly hard time making a decision from the menu which is divided into sweet, savory, and vegan waffles as well as bowls and scrambles. The bowls and scrambles allow you to make your own egg or tofu creation with whatever toppings and sauces you would like. As for waffles, you can choose whether you would like them to be made with a biscuit, buttermilk, cornmeal, vegan sweet potato, or gluten free base. I chose to have the Biscuits and Gravy special which was a biscuit waffle topped with potatoes, onion, scrambled eggs, cheese, and vegan sausage gravy (which I substituted for regular gravy). Once I added Siracha for a little extra flavor, I was in heaven. My husband chose the Slinger which was a waffle topped with chili, onions, cheese, and a sunny-side up egg. While he liked it, he thought the potatoes on my waffle would have been a good addition to his. 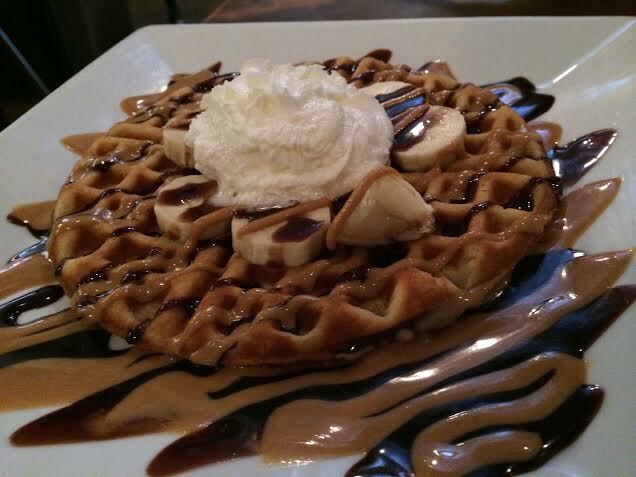 We couldn’t leave without trying a sweet waffle so I chose the Psycho Monkey. This waffle, topped with peanut butter, chocolate sauce, bananas, and whipped cream, made me go from liking to loving my meal. Want to get a little more creative? Check out the Elvis with bacon cooked into the waffle or the Honey Badger topped with honey, peanut butter, and honey whiskey. I finished my meal completely full and loving this restaurant for both the food and atmosphere. Prices are reasonable and the portions are large. The games make it a great spot to bring kids and conversation on a first date would never go dry because the décor leaves so much to talk about. While Melt may not be for everyone, if you are a lover of waffles or are in search of a new late night spot, you need to come down to Cherokee Street to check it out.